To go along with our radiators we are offering 4-ply silicone rad hose kits. These high quality hose kits are designed to fit your K-swap perfectly. There are 2 hose kits available: The Driver side hoses will work with an OEM or aftermarket 92-00 Civic rad that has been relocated to the driver side. Passenger side hoses will fit with our K-Tuned passenger side mounted rad or modified aluminum radiators with relocated hose ports. 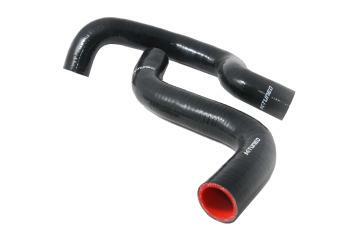 These hose kits will work with all intake manifolds and ITB’s. No more rad install headaches or messing around with universal hoses.